How sexist is the advertisement industry these days? During the Beijing World Women’s Conference in 1995, governments and ad-makers made a pact to rid the world of ‘negative or humiliating’ images of women. Did you notice a change? No, didn’t think so. As a female copywriter, I recently made a remark about the lack of women in a campaign proposal. So I was asked to do what women mostly have to do: pose for the camera. Granted, the situation has slightly improved since the 50s and 60s. Take a look at the vintage proof. What about today? What about the campaigns that are running right now? The ad business is still a man’s world, even in the 21st century. Take AXE, for instance, a brand that clearly identifies itself as a man’s brand. ‘Masculinity’ is what separates AXE from other beauty brands and is emphasized to death in their ad campaigns. In the AXE villa commercial, women are portrayed like objects that are just sitting around, waiting to be used by a man. 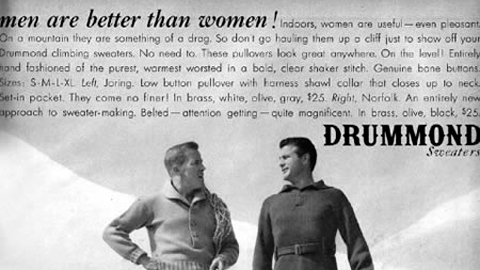 Even brands that aren’t geared towards men aren’t afraid to make sexist commercials. 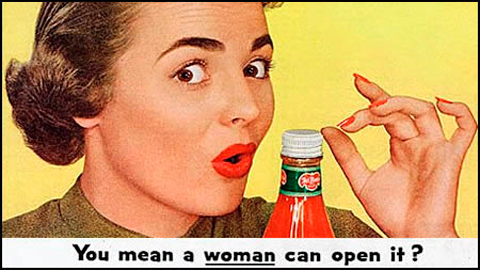 The first Dr Pepper Ten campaign was even purposefully discriminatory towards women. Just like Coke Zero and Pepsi Max, this drink was specifically created for men. Which isn’t necessarily a bad thing: some men want products that are low on calories, but are afraid to be associated with the word ‘diet’. Real men don’t drink diet sodas, do they? 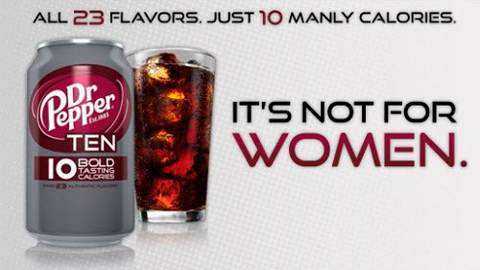 The difference between Dr Pepper and Pepsi and Coke is the extremely clear-cut message Dr Pepper is sending: “It’s not for women”. Could it be any clearer? Actually, it could be because women aren’t even allowed on the drink’s Facebook page. They were blocked from accessing the page on the first weeks of the campaign and were forwarded to a Dr Pepper website where they could find a ‘women’s drink’. Women were forced to create a fake Facebook profile if they wanted to access that Facebook page. 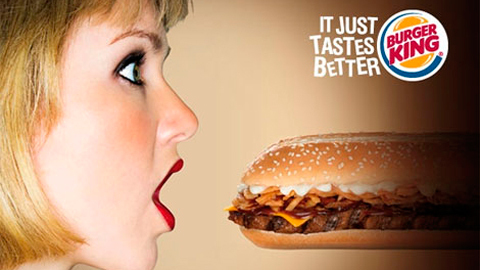 And what are your thoughts on this Burger King campaign for the “BK super seven incher”? The picture speaks for itself, but even the header and accompanying copy leave nothing to the imagination: “Fill your desire for something long, juicy and flame-grilled with the new BK super seven incher”. The question remains whether the image is capable of stimulating the consumer’s appetite for a burger. 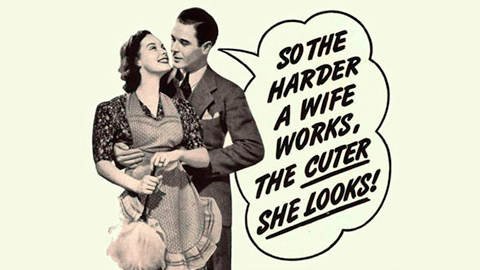 And it’s not just in the United States where sexist ads like this are being made. European campaigns often don’t treat women any better. Dutch menswear brand SuitSupply caused quite a stir when they came out with this ad. “Too sexist! It’s pornographic!”, or so some people claimed. The campaign refers to male dominance: the female models are portrayed as passive and down for anything. SuitSupply was flooded by complaints, but the Dutch Advertisement Code Commission didn’t think the campaign was against ‘good taste and decency’; as a result the ads weren’t banned. 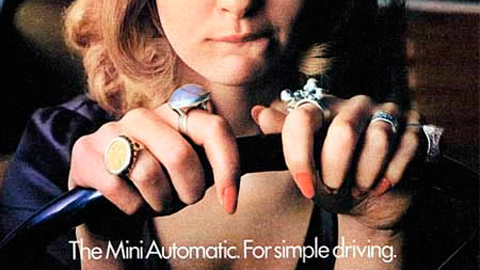 The brand went on to explain the campaign on their website, stating that the ads are open to interpretation and that people are imagining the stereotypes. Uhm, if you say so, SuitSupply. 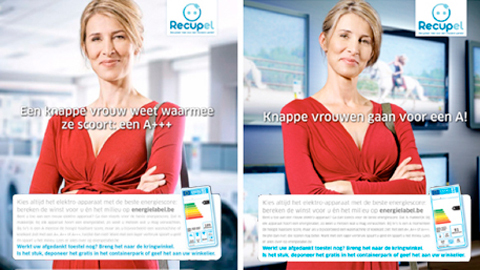 And how about this campaign by Belgian energy label Recupel? The woman is doing laundry and the big boss man is in charge of the budget. But how are we to please our men? With the right cup size, obviously. Boys will be boys, I guess? Now if you’ll excuse me, I’ve got laundry to do plus I feel all distracted by the account manager next to me who just doused himself in AXE Super Dry Focus and all of a sudden I’m totally craving a long and yummy super seven incher.